This is the first of Klune’s books that I’ve actually read. In the past year, I have enjoyed several of his audiobooks, with the majority of those causing me to laugh so hard it was a wonder I didn’t pull a stomach muscle. As such, I was not the least bit prepared for how hard Olive Juice would hit me. I knew that Klune could rip my heart out with his words, but I did not expect the level of devastation I experienced while reading this novella. I have spent much of the past two hours bawling my eyes out and now have puffy eyes, a runny nose, and a book hangover that rivals that of books I have spent days reading. Seriously! A novella that I can read in two hours should not make my heart hurt this much. And yet, even as I read the final words, tears running down my face, I was still left with hope. Hope that David might accept the redemption that Phillip was offering. Hope that two men who loved each other so deeply, who endured a horrific tragedy no one should ever have to experience, and who lost their way might find their way back on life’s path together. Olive Juice has one of the better written blurbs I’ve encountered in while. This may sound like a strange thing to mention in a review, but I’ve had discussions recently with others of how readers’ demands for trigger warnings has resulted in blurbs that often remove the element of surprise. While Olive Juice doesn’t contain content that would require a trigger warning, in my opinion, the blurb is written to entice a reader without preparing them for just how emotionally devastating the story can be. Even though Klune’s fans are familiar with how well the author is able to convey his characters’ emotions and how easily it is to fall into the story, that may not be enough because “the wreckage of the memory of a life no longer lived” does not even scratch the surface of what David and Phillip are dealing with. The author’s words are so poignant that I could not stop reading, no matter how hard I cried, no matter how much I wanted to walk away from the heart break, no matter how much it hurt, because there was always hope. A few words of warning for potential readers. First, don’t read Olive Juice in public. I am not a pretty crier, but even if I were, there was no hope with this one as there were moments when I was full-on sobbing. Second, have your tissues handy. This was a two-tissue read for me and while that might not sound like a lot, it only took me a little over two hours to read it. Third, the story is told from David’s point of view and we spend a LOT of time in his head as memories play out. Personally, I don’t have a problem with books filled with character introspection, especially when it’s appropriate for the story, but I know some readers don’t care for that style of writing. I will say that for Olive Juice, it works perfectly and because I refuse to spoil the story for potential readers, it’s nearly impossible for me to explain why except to say that the way in which David and Phillip’s history and redemption plays out is well-suited for the introspective style. 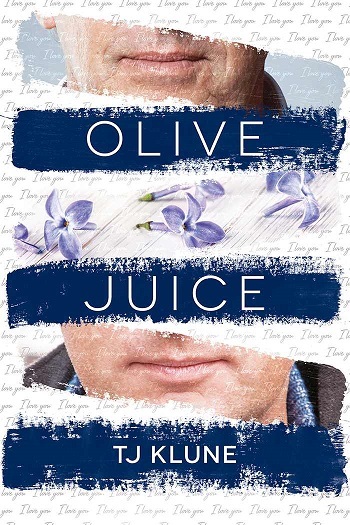 Olive Juice is one of those books that earned five stars from me not because it’s a story I know I’ll reread, but because it’s one that hit me hard, made me think, and will leave a lasting impression long after I finished it. It was not what I was expecting, but I’m so glad I read it. Reviewers on the Wicked Reads Review Team were provided a free copy of Olive Juice by TJ Klune to read and review.